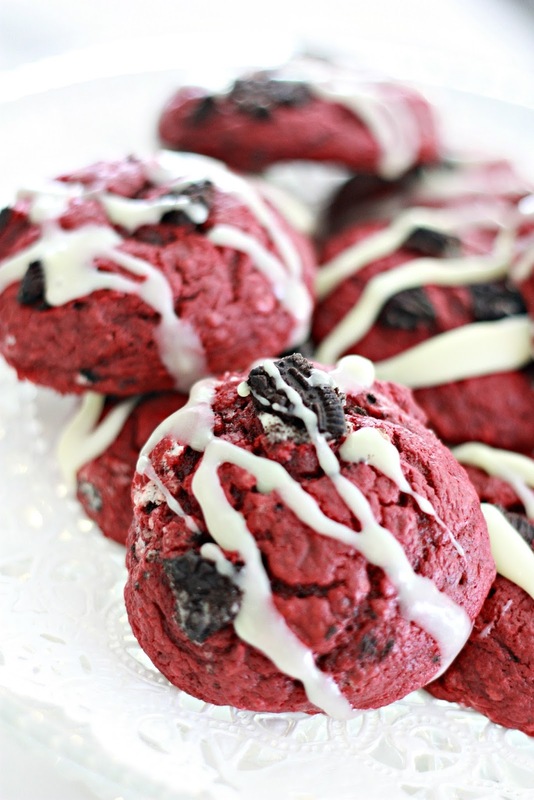 You'll love putting these Red Velvet Oreo Cheesecake Cookies into your regular or Christmas baking routine. They're a delicious moist, rich and white chocolatey cookie that delivers a wonderful mix of all your favorite flavors. Important tip: Once you've mixed your batter, you'll need to sit it in the fridge for about 30 minutes. In a large mixing bowl, mix your cake mix, soften butter, 2 eggs, soften cream cheese together. Then gently fold in your crushed Oreo cookies. Once everything is mixed together, cover your batter with plastic wrap & place in the fridge for about 30 minutes. Using a cookie scoop, place your cookie dough on a baking sheet and bake for 10 minutes. Recipe will make about 2 dozen. Once your cookies have cooled, melt your white chocolate chips in the microwave in 20 second intervals. Stirring every 20 seconds. When your chocolate has melted, drizzle over your cookies as desired. 0 Response to "RED VELVET OREO CHEESECAKE COOKIES"